Today, the standards of commercial cleaning are changing, and businesses such as educational facilities, manufacturing facilities, and data centers are going green, and Valor Janitorial is no exception. Our New Green Clean process provides everything from environmentally friendly cleaning products to training and processes, paper products, mops and matting, and equipment in order to provide the safest green cleaning services possible. Whether your goal is the general benefit of green cleaning, the pursuit of LEED certification or positive publicity, our green cleaning services can assist in projecting a good business image. Why Go Green? Considering these facts, it’s easy to understand why businesses are becoming increasingly concerned. It’s about our environment—and it’s also about your bottom line. Facilities that use our New Green Clean services see a reduction in healthcare costs, supply costs, utility bills/costs, and an overall improvement in productivity from a happy and healthy staff. 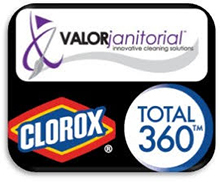 Contact Valor Janitorial today for more information on our Dallas commercial cleaning services.